Woman Charged With Fake Witchcraft, Days Before Canada Scraps Old Law Police say the woman "attempted to elicit funds ... in return for protection from some form [of] potential danger." The law was scrubbed from Canada's criminal code last week. Canada eliminated a number of obsolete and redundant laws last week — but not soon enough for an Ontario woman charged with fake witchcraft. 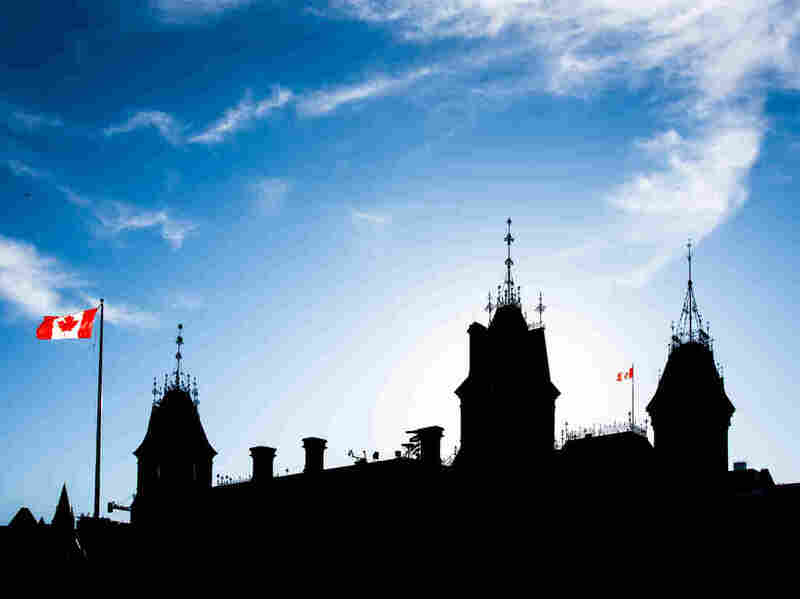 The East Block of Canada's Parliament Buildings are seen here. Last week, Canada repealed a number of so-called "zombie laws" that remained on the books after they were found to be unconstitutional, redundant, or just, well ... too old and weird. "Every one who fraudulently (a) pretends to exercise or to use any kind of witchcraft, sorcery, enchantment or conjuration, (b) undertakes, for a consideration, to tell fortunes, or (c) pretends from his skill in or knowledge of an occult or crafty science to discover where or in what manner anything that is supposed to have been stolen or lost may be found...."
Despite the federal government's labeling that law as archaic and slated for erasure, an Ontario woman was charged last week with fraudulent witchcraft – fortunetelling, specifically – just two days before the law was eliminated, the CBC reports. Police in the small city of Timmins told the North Bay Nugget that allegedly "a local woman, who maintains an alias and holds herself out to be a self-proclaimed spiritualist, medium and clairvoyant, attempted to elicit funds from a Timmins resident in return for protection from some form [of] potential danger likely to occur to her family." The accused is 33-year-old Tiffany Butch, who goes by the nickname "White Witch of the North" – but she says it's a misnomer. "People proclaimed me a witch here and gave me a nickname, but I'm not a witch," she told the CBC. "I'm a psychic." A spokesman for the Timmins police told the broadcaster that they use the most applicable laws on the books at the time of the alleged offense. "Section 365 has been law in Canada since 1892. It originated in a British statute from 1735 that repealed an earlier British law classifying witchcraft as a felony, after centuries of witch hunts in early modern Europe. The 1735 repeal reserved 'a minor punishment' for 'cheats and rogues' pretending to practice witchcraft, according to a paper in the Marquette Law Review. "The law remained unchanged in Canada over the centuries but for the addition of the word 'fraudulently' in the 1950s." Butch has been summoned to appear in court next month. The CBC reports she denies the allegations and believes she was framed by other psychics.